Fundraiser by Bessie April : Break out Bandit! 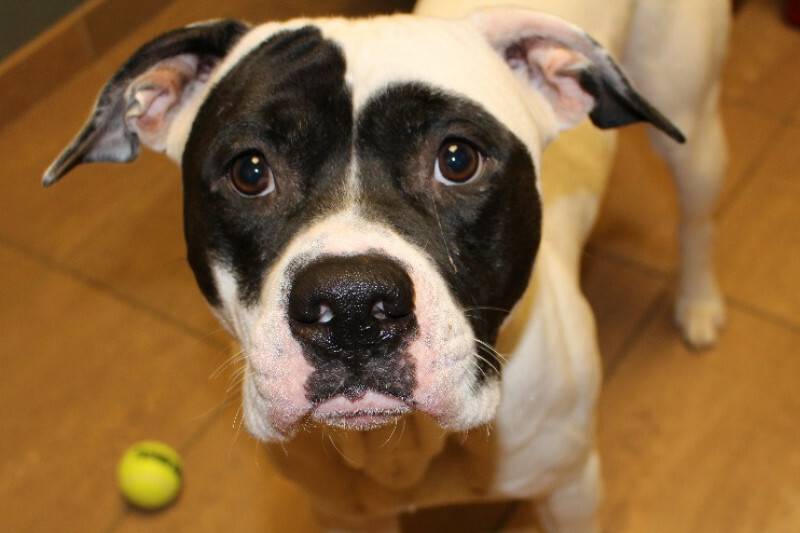 Bandit is an approximately 3 year old incredibly handsome American Bulldog Mix who came into animal control in the Kansas City area as a stray. He is on the timid side, mild mannered, and sweet. He sits in his kennel run with this face on the ledge breaking hearts all day. He loves to lean in for pets and will sit and let you pet him as long as you'd like. When walking he sticks very close, and really loves human interaction. For many reasons, including breed specific legislation in Kansas City, an overpopulation of bully breed dogs in the shelter, and Bandit being fearful around other dogs, he has very little chance of getting adopted. Lee Summit is a kill shelter, and those who have been actively networking Bandit are worried his time is running short. We have devised a plan to get him out of the shelter and into a 4 week, reward based training program. After this program, he will be much more attractive to potential adopters and in a better position to find his FURever home! Please help us break Bandit out of the shelter and into training, the first step toward his new life! Your donation will do directly toward Bandit's Board and Train stay, and transport costs to get him to his new (pit-bull friendly) home, Austin, TX.